Now at six generations of winemaking history, Jean-Loup Michel and his nephew Guillaume carry on centuries of tradition in crafting pure and pristine Chardonnay. The domaine switched to fermenting and aging in stainless over 40 years ago, and are hands down the reference point for the style. Through premium parcels and meticulous farming, this family operation is able to cultivate a fascinating array of flavors, using the most innocuous of vessels to simply get out of the way of the fruit. Mineral-driven vintages help delineate the individual characteristics of a site which is exciting for a producer whose breadth of high quality vineyard holdings is rivaled by few wineries. Jean-Loup works with extremely old vines—in some cases upwards of 60 years. The result is a deep expression, as age worthy as any Chablis domaine. From top to bottom the wines are accessible now. With that, our recommendation is, should you pull some corks on the Premier Crus in the next 2-3 years, please do pour them into a carafe or decanter and expect them to shine after 60 minutes of breathing. Butteaux - Found in the Montmain valley bottom, they grow grapes in six neighboring parcels. In the past, they blended this harvest with Forêts under the Montmain vineyard name, but for the last few years they have matured it separately. Forêts - Not far from Butteaux, Forêts was also blended with Montmain in the past. However, the characteristics of this very mineral terroir prompted us to separate our two parcels into their own individual productions. Montée de Tonnerre - Located on the right bank of the Serein, Montée de Tonnerre is certainly the most prestigious and highly renowned of all the Chablis Premier Crus. Fourchaume - The whole of the Fourchaume vineyard is spread over 3 km (1.8 miles), but also includes a second smaller area in the valley where the Grand Crus are found. Called ‘Vaulorent’, this small enclave among the Grand Crus is where the domaine planted just under 1 acre of Fourchaume vines in 1963. 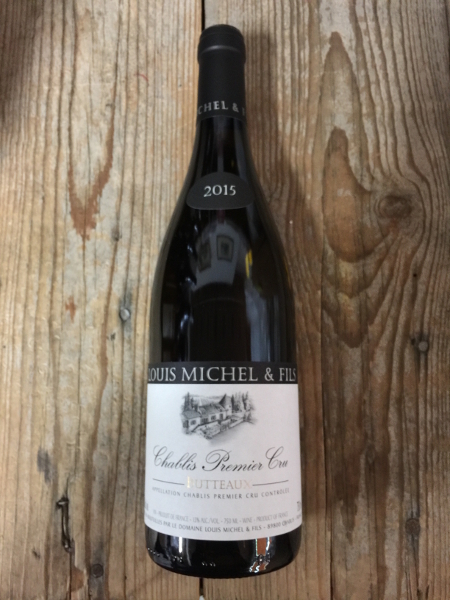 From acclaimed British wine writer Jancis Robinson, "Those who favour stainless steel want the purest flavour of Chablis, with the firm streak of acidity and the mineral quality that the French describe as ‘goût de pierre à fusil’ or gunflint. LouisMichel's is generally considered to be the epitome of this style." Clive Coates - The Wines and Domaines of France?? "This is a brillant consistent estate, where there is no use of wood (barrels in the cellar are only for show). The wines are vinified in a temperature-controlled room full of stainless steel vats of different sizes and not bottled until a year or eighteen months afterwards- or even later. The magnificently austere and steely wines keep much longer than most Chablis..."? Jean-Loup Michel makes some of the cleanest, freshest wines in Chablis. In the great oak-versus-stainless-steel debate, the Michels are firmly in the latter camp. They make nine wines, mainly from Grand Cru and Premier Cru Vineyards, and not one goes anywhere near an oak barrel. ?The best wines (Les Clos, Montmain, Montée de Tonnerre) will age for up to eight years. Michel's bottling amply reflect their vineyard origins and are the premium example of Chardonnay in its purest, unadorned form..."